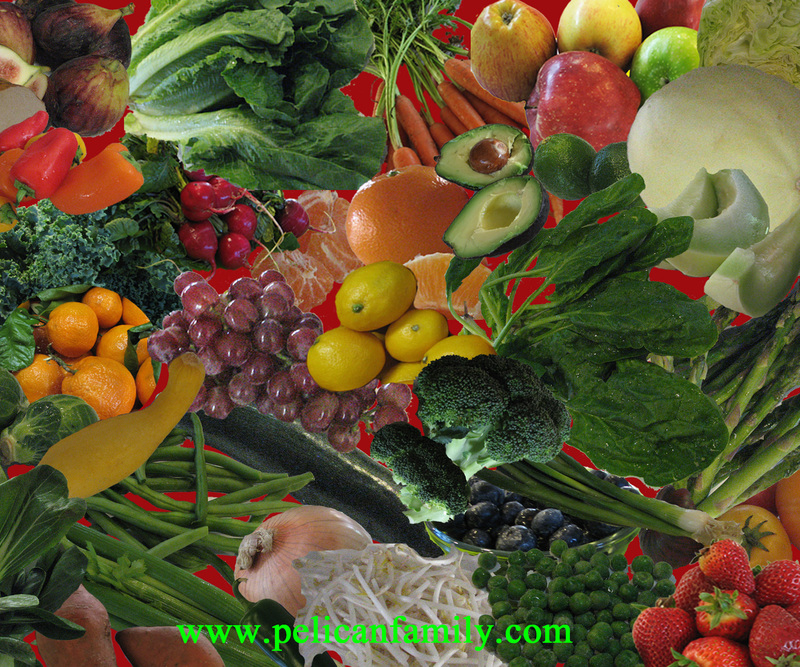 Take The Healthy Alphabet Challenge! In our book, Delly and the Beach Town Healthy Alphabet Challenge, Delly, who is always hungry, teams up with Chef Chauncy in Beach Town to introduce the children at the school to fruits and vegetables from A-Z. For this book, instead of taking photos of pelicans and ocean scenes, I spent a considerable amount of time taking photos of fruits and vegetables. They are so beautiful and colorful! I loved doing it, and I got to eat the subjects of my photos! 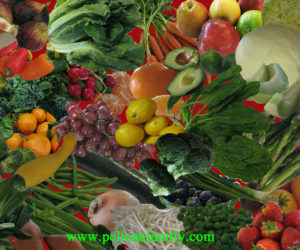 Here’s what you do for the Healthy Alphabet Challenge. 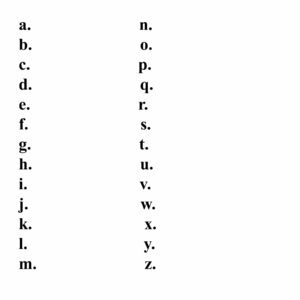 Write the letters A-Z down on a paper, like this. 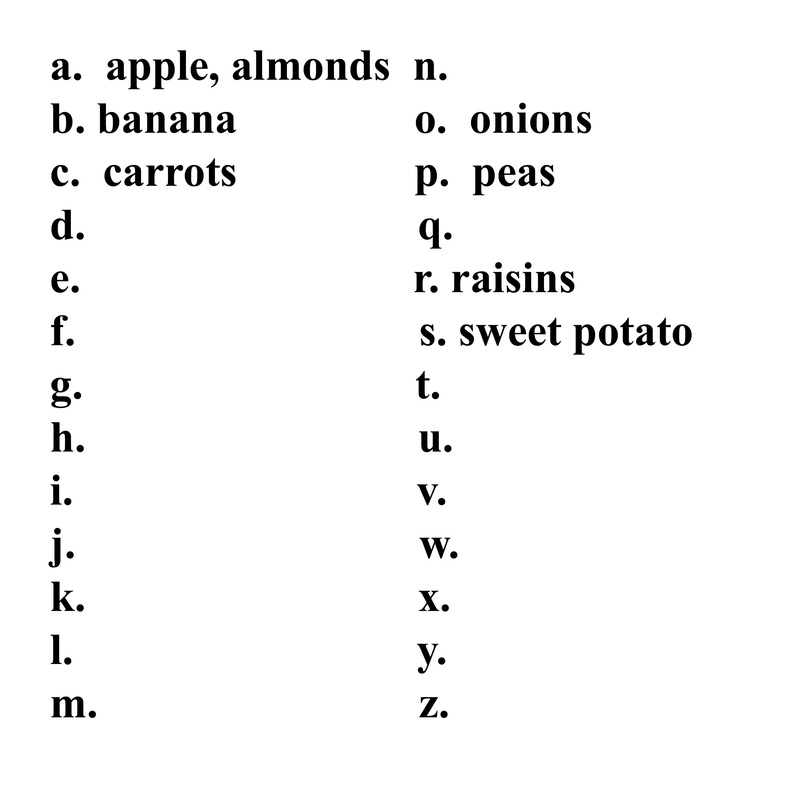 Try to buy vegetables and fruit that start with every letter of the alphabet, as you go about your monthly shopping. (Not all at once. They’ll spoil before you get to them.) Prepare and eat them. Write down what you ate next to the letter. 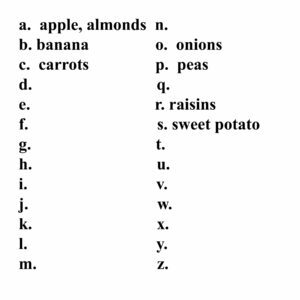 See if your family can try healthy fruits and veggies for all the alphabet. Make it fun. Treat it like a game. It will certainly be a healthy one! Here are the results of the fruits and veggies I ate yesterday. Different Fruits and Veggies I ate one day. Maybe I can try at least one for A through Z in a month. Can You? 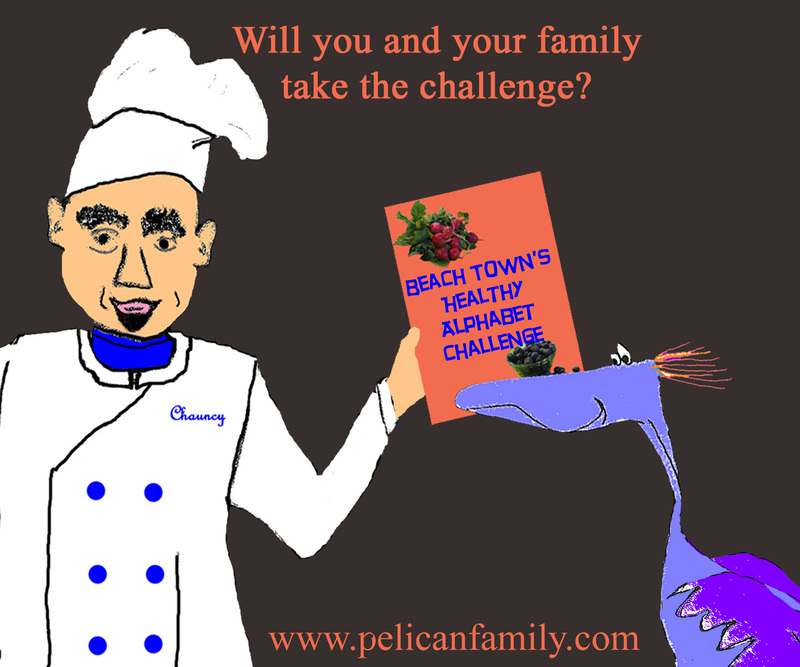 Get our book Delly and the Beach Town Healthy Alphabet Challenge for ideas to try. You could even take the book with you to the grocery store and let your kids pick out fruits and veggies pictured in the book to try for the week. Then, consider letting them help prepare them to eat. Kids often like to try things they have helped fix. 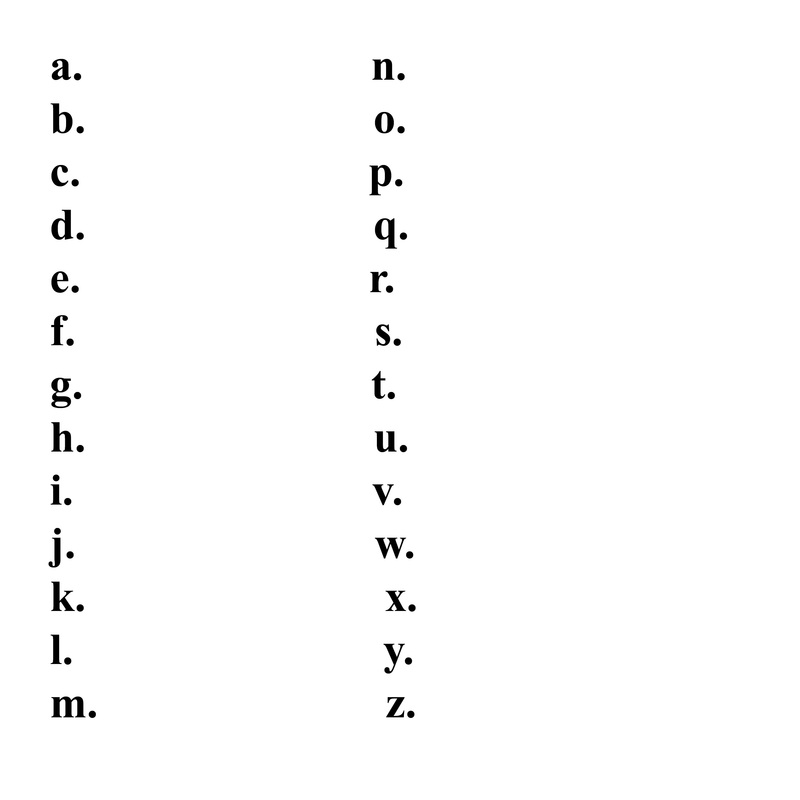 At the back of the book, there is an alphabet listing for what some ocean animals eat. 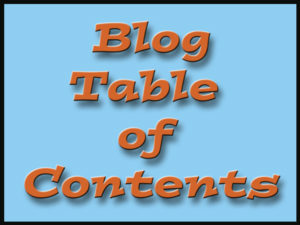 It could be used to talk about food chains. And, the pelican foot stamp used in the book to reward the school children for trying the day’s food, is the actual size of a real Brown Pelican’s foot. When I was reading this book to a group of children, once, one of the listeners asked me how I got the pelican to stand still so I could trace his foot. That was a great question! I always love it when children ask questions that show they are really thinking about what they are seeing and hearing. I didn’t trace the foot of a live pelican. That would have been very difficult. I went to the Morro Bay Museum of Natural History and the docents there let me carefully trace the foot of a stuffed pelican on display in the museum. You could use our book with very young children just to introduce them to naming different fruits and veggies, and also naming colors. If you and your family try the Healthy Alphabet Challenge, let us know. It would be great fun to hear about your experience with it. Thank you! My sister is going to try it with her granddaughter, who is not overly fond of veggies. I hope more people try it.